There stood a foul thing, a great, black beast, shaped like a hound, yet larger than any hound that ever mortal eye has rested upon. And even as they looked the thing tore the throat out of Hugo Baskerville, on which, as it turned its blazing eyes and dripping jaws upon them, the three [men] shrieked with fear and rode for dear life, still screaming, across the moor. In many lands around the world, the week spanning Christmas Day and New Year's Day is often deemed to be an uncanny even preternatural period of time, during which all manner of strange events may occur or surreal entities be seen. So when better than now to present as my final ShukerNature article for 2018, an examination of the truly mystifying phenomenon of phantom Black Dogs. The monstrous canine star of Sir Arthur Conan Doyle's most famous Sherlock Holmes novel would be terrifying enough if it were wholly fictitious. 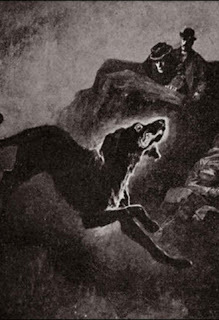 Incredibly, however, Conan Doyle's inspiration came from reality – generations of sightings and lore concerning a black-furred phantom dog known locally as the Black Dog of Hergest on the English-Welsh border. Moreover, many people do not realise that there really is a Baskerville Hall, near the Welsh border village of Clyro, to be precise – at which Conan Doyle stayed, and where he heard tales of the ominous Black Dog. It was only to preserve the privacy of the Baskerville family that when Conan Doyle decided to use their name and the Black Dog legend as the basis for a forthcoming Sherlock Holmes novel, he relocated it from Wales to Dartmoor. 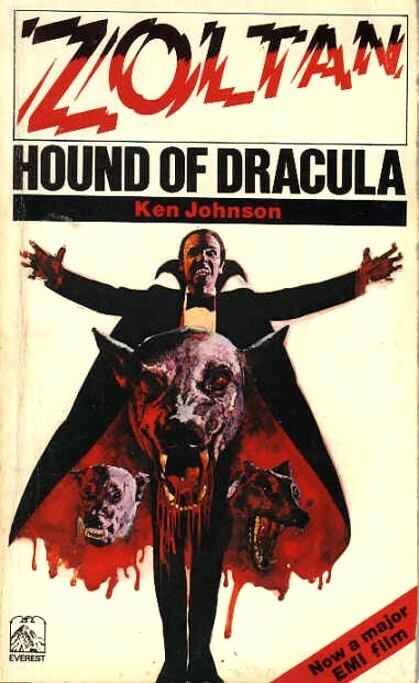 Yet here too there are a number of legends of spectral, ebony-hued hounds with fiery eyes (of which Conan Doyle was also aware), just as there are in many other British localities, as well as in mainland Europe, and even in regions as far-flung as North America and Australia. Collectively, these canine apparitions are variously referred to as Black Dogs or Hell Hounds, and are among the most perplexing, and, quite often, sinister, zooform (animal-assuming, paranormal) entities on record. 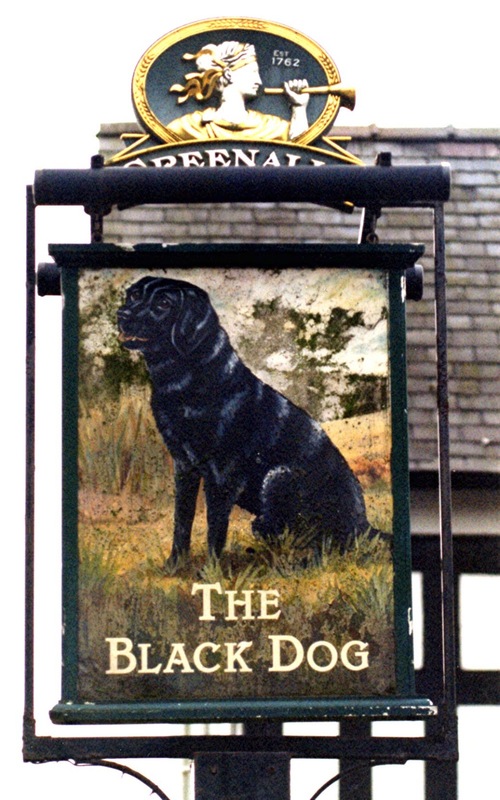 Many sightings are associated with certain country lanes or paths, and there is more than one inn and public house in England named 'The Black Dog' on account of Black Dog legends linked to nearby walkways. 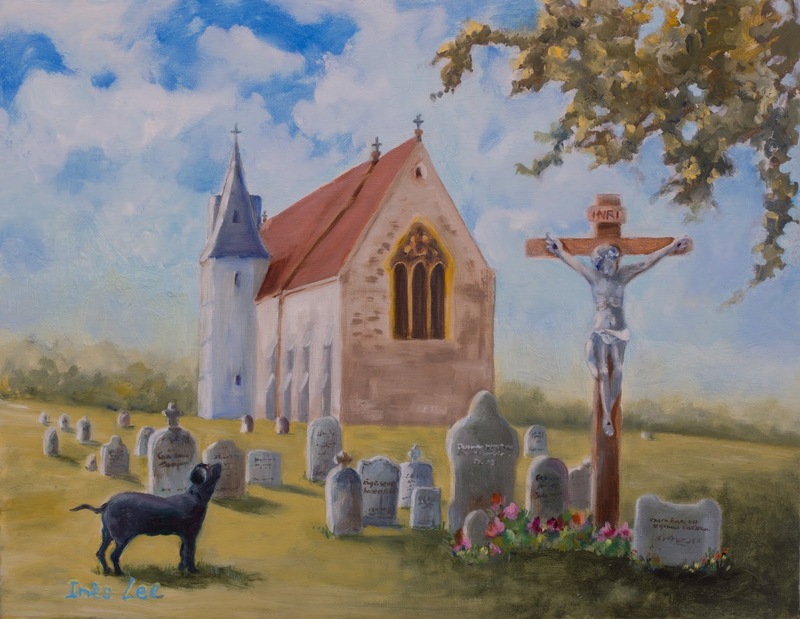 Churchyards are another frequently-reported location for Black Dog sightings (these Black Dogs are termed Church Grims or Kirkgrims), as are localities close to stretches of water, and even certain urban roads and streets are reputedly haunted by these eerie entities. 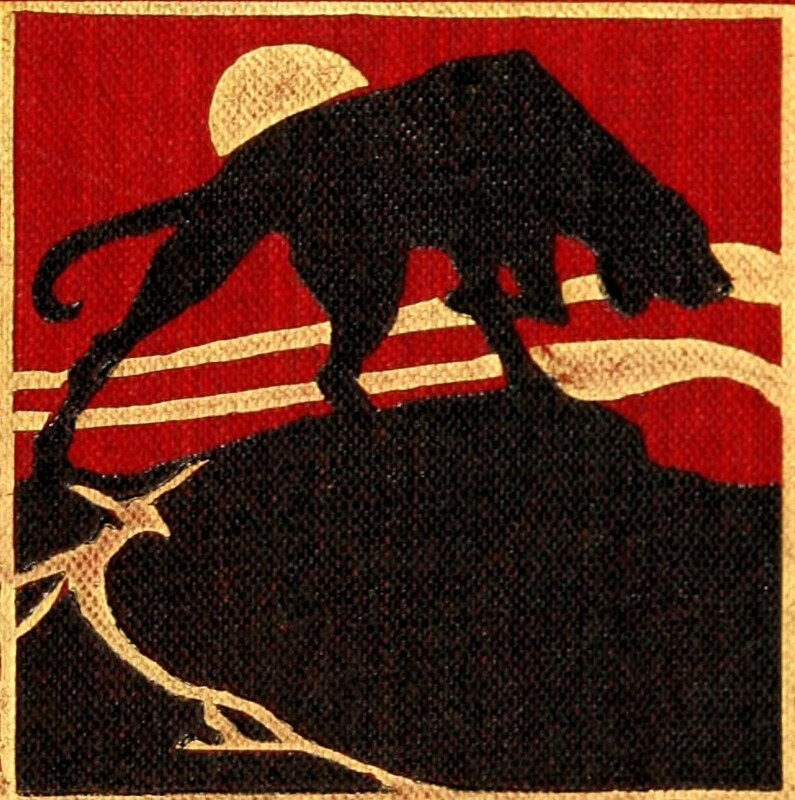 So commonly spied are certain regional Black Dog manifestations that they have their own names, such as Black Shuck in Norfolk, Padfoot in Staffordshire, Barguest in Yorkshire, Hooter in Warwickshire, Hairy Jack in Lincolnshire, Gwyllgi (Welsh for 'dog of darkness') on the Welsh coast, Mauthe Doog in the Isle of Man, Skriker ('howler') or Trask in Lancashire, Muckle Black Tyke in parts of Scotland, and Tchico in Jersey. WHAT MAKES A BLACK DOG A 'BLACK DOG'? Of course, there are all manner of comfortingly corporeal, perfectly prosaic canine beasties running loose in our towns and countryside, having absconded from or been let off the lead by their owners. So how can we tell these 'normal' black dogs from the 'real' Black Dogs? There are, in fact, several very important signs to look out for. First and foremost: Black Dogs often exhibit the alarming ability to vanish into thin air, in full view of their astonished eyewitnesses. One excellent example of this occurred on 19 April 1972 at Gorleston, in Norfolk. It was about 4.45 am, when coastguard Graham Grant caught sight of a very big, jet-black hound-like creature running along the beach. Grant stood watching it for a few moments until suddenly, as he continued to look at it, the animal disappeared! One second it was there, the next – gone! Across 'the pond', 16-year-old Mark Chester from Atlanta, Georgia, and a friend, Jeff, were driving one evening in 1979 along the aptly-named North Druid Hills Road when, about 75 yards ahead on his side, Mark saw what looked like a black labrador retriever trot out into the road. As it was not yet dark and the road was well lit by streetlights, this animal was perfectly visible, despite its dark coat. To the teenager's amazement, however, just as the 'dog' was approximately three-quarters of the way across the road, it simply vanished. Jeff saw it vanish too. Recalling the incident 15 years later, Mark was still certain of what he had seen: "I know what I saw. There is no doubt in my mind that something was in the road that night and then it wasn't". In 1981, Irene Cole and her husband were driving along the Stanner Road in Herefordshire, and were just a mile or so from Kington, when they saw an immense Black Dog sitting motionless in the road, at the bottom of a hill. Her husband swerved to miss it, there was no impact, and the dog simply vanished, without a trace. OMENS OF DOOM – TOUCH NOT THE DOG! Certainly, a notable characteristic of Black Dogs according to legend, lore, and also modern-day testimony is that they are said to be harbingers of doom, their appearance often foretelling death or impending bad luck – and which is almost always guaranteed if anyone is unwise enough to touch such a creature, especially if done in a violent, threatening manner. One evening in 1927, a friend of the famous Manx author Walter Gill was walking along a road close to Ramsey when he came upon a typical phantasmal Black Dog – jet-furred and fiery-eyed – standing directly in his path so that he was unable to pass, and staring resolutely into his face. Mindful of the danger of making physical contact with a Black Dog, Gill's friend made no attempt to push by it, but stood his ground and waited, until eventually the Black Dog moved to one side, allowing him to pass. Nevertheless, its very presence had seemingly been dire enough, for not long afterwards the father of Gill's friend died, and he was convinced that the Black Dog's appearance had been a warning of this. Back in 1893, two men driving a cart along a Norfolk lane had similarly encountered a blaze-eyed Black Dog blocking their path. Unlike Gill's friend, however, they had shown far less patience and wisdom, because the driver aggressively ran their cart directly at the creature! As soon as the cart hit it, however, the Black Dog vanished in a brilliant ball of fire, filling the air with a vile sulphurous stench, and just a few days later the driver died. Judging from that, the Dartmoor farmer who struck with a poker a red-eyed Black Dog that had appeared outside his and his wife's bedroom door one early winter morning in 1972 was lucky indeed to escape with his life. Just as in the Norfolk incident, the Black Dog instantly vanished in a blinding, exploding flash of light, but the farmer and his wife experienced no ill effects. The same, however, could not be said for their house, whose entire electrical circuitry was destroyed, along with every window, and even a number of tiles on the roof were dislodged, such was the power of the explosion. Sometimes, those few who have been brave, or foolish, enough to touch a Black Dog and have survived the experience have reported a very eerie characteristic of their close encounters. Stretching out to stroke or pat the Black Dog, they have found to their amazement that their hand has passed straight through it, as if the creature were no more than an illusion, or ghost, and also that the Black Dog has not even reacted to their action – just as if it were not even aware of their presence. As already noticeable from the reports documented so far, a readily visible feature immediately distinguishing Black Dogs from black dogs is the blazing, scarlet appearance of the former entities' eyes. "Like live coals inside the monstrous head" is how one terrified Black Dog eyewitness, a student from Trinity College, Dublin, described them after seeing a huge Black Dog walking towards him one spring day in 1928, as he was fishing in a river close to his Londonderry home during the Easter holiday. So petrified was the student by this rapidly-approaching apparition that he abandoned his fishing and clambered for safety into the branches of a tree close by, from where, still shaking with fright, he gazed down as the Black Dog walked underneath and looked up at him, baring its teeth, before passing on by. Eye-shine in normal, flesh-and-blood dogs is a greenish-yellow glow. Having said that, during some investigations of mine into eye-shine in animals I discovered that certain eye conditions, such as cataracts and keratitis, can create an abnormal reddish eye glow or bloom in dogs (click here for more information). 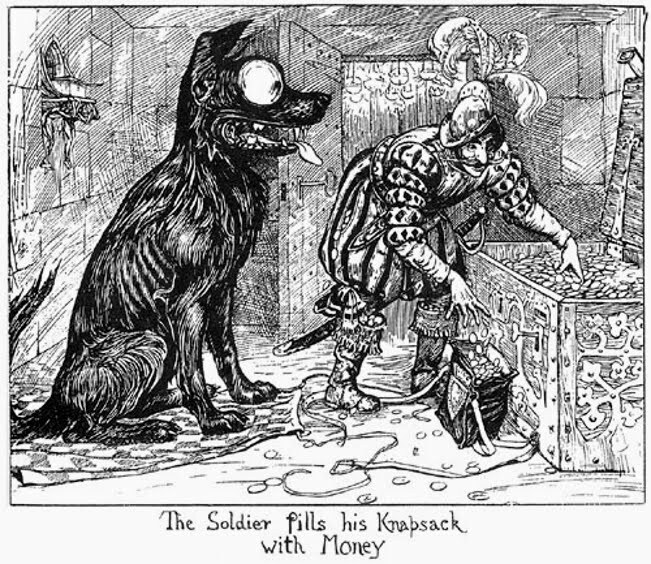 So it is possible that at least a few cases of red-eyed Black Dogs were actually nothing more than normal, flesh-and-blood black dogs with eye ailments. 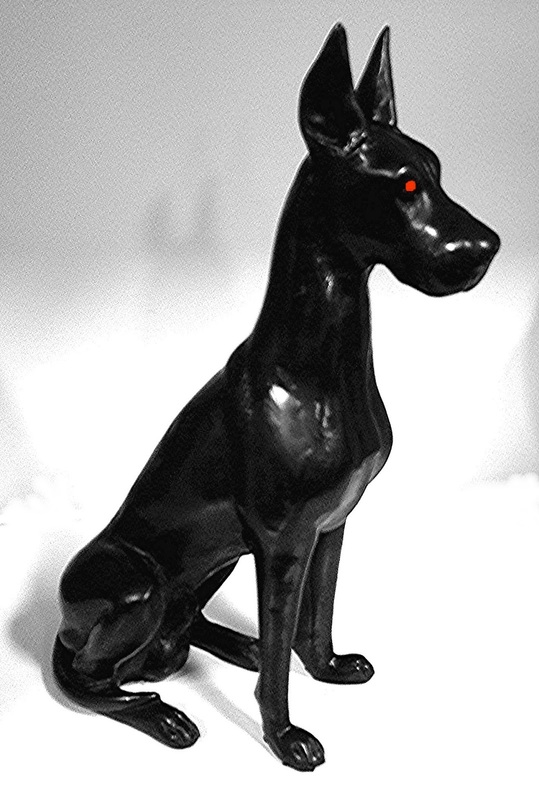 However, this cannot explain all Black Dog reports with glowing red eyes – there are far too many on record. Rough, shaggy fur is another frequently-described facet of Black Dog morphology, as well as caliginous, and sometimes fiery, sulphurous breath - more distinct than the normal panting breath of a dog rendered visible on a cold morning. In the vast majority of reported cases, Black Dogs are said to be entirely silent, padding alongside or near to their eyewitness in a spookily soundless manner. Curiously, however, one or two of these ghostly creatures are associated with the sound of rattling chains, and there are also a handful of reports describing splashing noises, as if the creature were wading through or emerging from water. A famous Black Dog associated with chains is the Newgate Monster, reported and depicted in a broadside from as long ago as 1638. 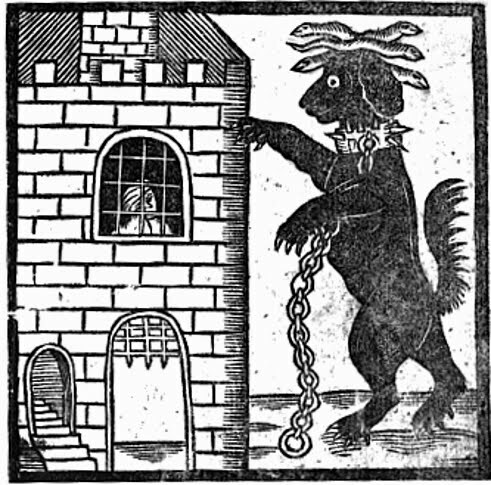 This sinister Black Dog apparently was often seen gliding up and down the streets adjacent to the ivy-covered wall at the end of Amen Court, and sometimes crawling along the top of the wall itself, dragging a heavy chain, just before an execution was due to take place at the original Newgate Prison nearby (the new Newgate Prison was built there in 1783). Moreover, in traditional lore, some of the diabolical Hell Hounds are given to voicing ferocious, spine-chilling howls and bays, terrifying their onlookers. An extremely noticeable physical characteristic of Black Dogs is their very large size. For whereas some have been likened to labradors, others have been compared in size with calves and even small horses! Take, for instance, the red-eyed Irish Black Dog seen lying in the road early one evening in the 1930s by a person walking her dog close to County Mayo's Pontoon Bridge Hotel – so huge did it appear that she had initially assumed it to be a donkey! 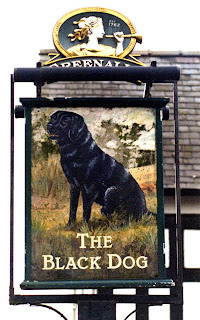 Similarly, the fiery-eyed, shaggy-furred Black Dog that haunts a lane in Uplyme, Devon – so regularly, in fact, that this route is actually named Dog Lane (there is also a Black Dog hotel there) – was said by a local woman who saw it in 1856 to be as big as a calf. Intriguingly, in October 1972 Tavistock police constable John Duckworth spied an enormous canine mystery beast on Dartmoor – resembling a black hound the size of a small pony, it had been seen by him once before, three years earlier. As recently as 1995, James Sanderson and three friends were driving home from Smarden, Kent, when they stopped in some fog, and were astonished to see a Black Dog walk by that was as big as their car. 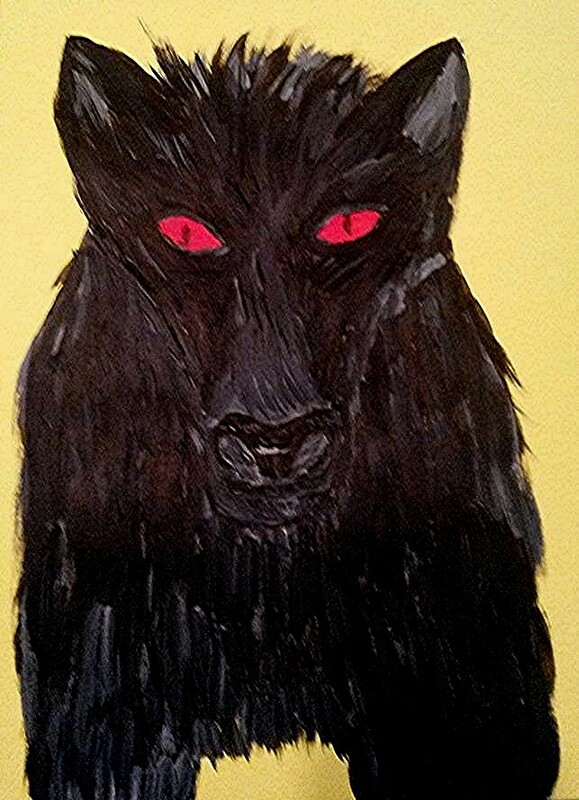 In 1986, after hearing a scratching sound in his yard, Robert Harman of South Tuckswood, Suffolk, decided to investigate, and was very startled to see a huge dog with red eyes leap over his wall. 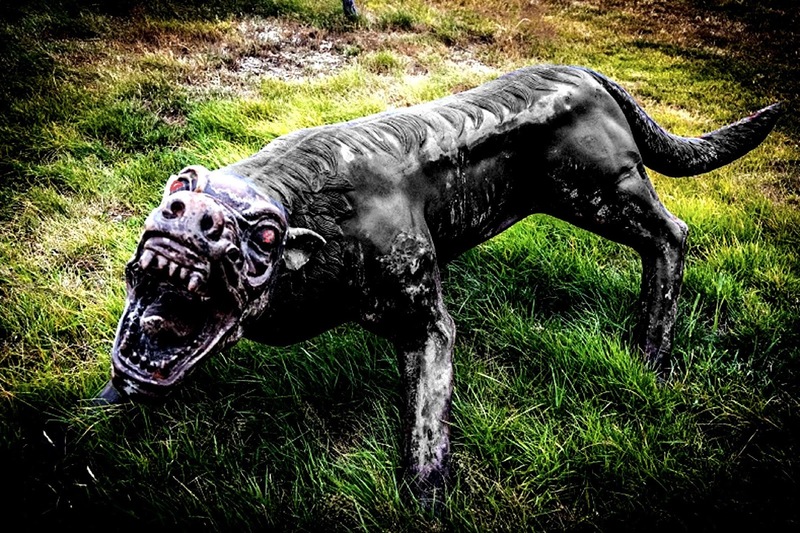 In 2001, Danish theologian Lars Munk encountered the famous Black Dog of Viborg, Denmark, one evening just after midnight at the ley-linked location within Viborg where this canine entity has been sighted many times down through the centuries. Sporting pointed ears and a ridge of harsh hairs along its back, it walked under a street light and looked directly at Munk, shimmering with a weird flickering fluorescent-green light before abruptly disappearing into the darkness. Clearly, Black Dogs are still very much around! There can be little doubt, judging from the sizeable archive of reports on file, that Black Dogs do exist – but what they actually are is much less easy to determine. Their ability to vanish in full view of their observer and their apparent insubstantial nature confirm that unlike their feline counterparts, Britain's motley assortment of mystery cats, Black Dogs are more than merely elusive creatures of cryptozoology. Instead, they are non-physical, preternatural entities, of superficially canine appearance but exhibiting some unequivocally non-canine attributes, both morphological and behavioural. 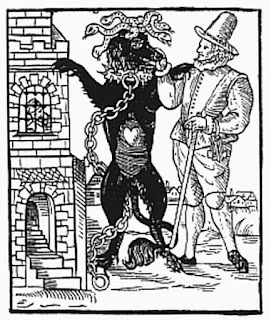 Based upon their definite attachment to certain specific physical localities, especially certain lanes, streams or rivers, churchyards, and even some ancient sites (many researchers have noted links between Black Dog appearances and the presence of ley lines, which are in turn associated with these types of locality), a popular identity proffered by investigators is that Black Dogs are a form of preserved image from the past – somehow preserved within a locality's geological composition, and which can be activated if precise meteorological conditions are met. Similar notions have also been proposed to explain other spectral phenomena, such as ghosts, and disembodied voices. It would be as if a film projector loaded with a loop of film had suddenly been switched on, and its film had been allowed to run its course. This theory would certainly help to explain various anomalous Black Dog reports in which the Black Dog has not interacted with its observer in any way, instead behaving in a manner seemingly oblivious to the observer's presence. In contrast, however, most Black Dog cases involve direct interaction between observer and Black Dog, which could not occur if the latter entity were, in essence, nothing more than a preserved, meteorologically-triggered, moving image from the past. A related hypothesis is that certain meteorological conditions, especially those associated with electrical phenomena, may induce hallucinations in people susceptible to such stimuli. 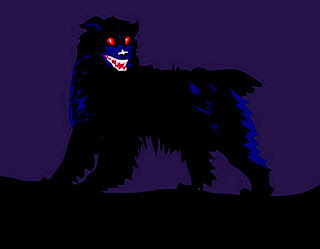 There is also the analogous possibility that some Black Dog experiences are temporal lobe apparitions – damage or malfunctions in this particular paired region of the brain are known to generate hallucinations during epileptic seizures, including ones that have the appearance (to the subject experiencing them) of external paranormal phenomena, including unearthly entities. Yet another psychologically-grounded theory is that certain people are actively generating these canine apparitions using the power, consciously or otherwise, of their own mind, yielding tulpoid Black Dogs that can fully interact with their creators and even other people. In some cases, they may even be hallucinations brought about by fatigue. For example, crypto-colleague George Warren Shank mentioned to me in September 2012 that in the USA truckers and other long-distance drivers are so familiar with spying non-existent black dogs induced by sleep deprivation and tiredness that they refer to them as dodgers, and on more than one occasion have nearly swerved off the road in order to avoid hitting such creatures, only to discover that there was nothing there. Perhaps the most popular idea is that Black Dogs are archetypal guardians of their respective localities, and, by extension in some cases, of people passing through these localities. There are several cases on file, for instance, of women walking alone at night along some lonely, potentially dangerous road, only to find themselves abruptly accompanied by a large Black Dog, walking silently beside them, and staying in their company until they are close or within sight of their destination, whereupon the dog vanishes as mysteriously and suddenly as it had appeared. CANINE ENCOUNTERS OF THE BIZARRE KIND! Whereas most Black Dogs are of the traditional, quasi-labrador kind described above, notwithstanding their fiery eyes and often-intangible nature, some far more exotic, even downright bizarre variations on this canine theme have also been reported. 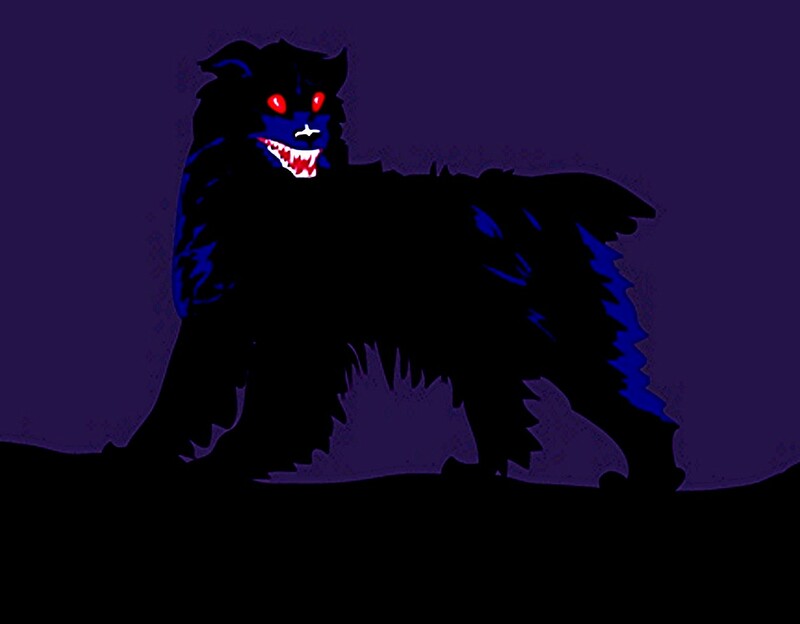 Black Shuck of Norfolk usually assumes the 'normal' Black Dog form, but on occasion has been reported as a terrifying hound totally lacking a head! Moreover, sometimes his head is missing but his blazing eyes are still present, floating in a decidedly unnerving, disembodied manner above his body at the level at which they would be if his head were present! 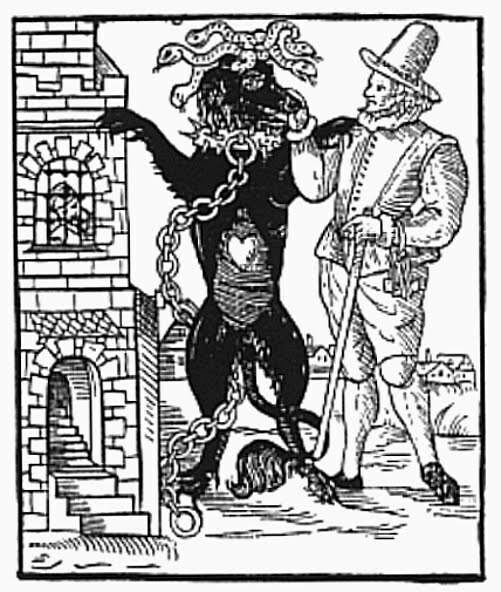 And speaking of headless hounds: the spectral Wish Hounds of Dartmoor (also termed Yeth Hounds or Yell Hounds) are also said to lack heads, whereas the unique Black Dog that traditionally haunts the environs of Suffolk's Clopton Hall is human-headed – specifically, it sports the head of a cowled monk. Most terrifying of all are the Devil's Dandy Dogs. Hailing from Cornwall, these huge jet-black diabolical Hell Hounds have saucer-sized blazing eyes, tongues of fire dart from their mouth, and on their head is a pair of horns! They are said to accompany the devil when he hunts on horseback across the Cornish moors, in search of human souls. 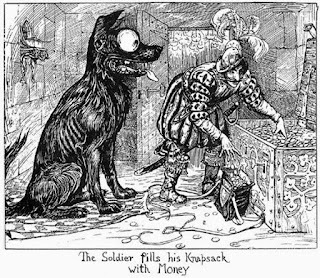 Incidentally, whenever I read about such creatures having saucer-sized eyes, I am irresistibly reminded of the trio of giant black huge-eyed dogs encountered by the soldier in Hans Christian Andersen's famous fairy tale 'The Tinder Box'. Might this story have been inspired by real-life reports of phantom Black Dogs in his native Denmark? BEWARE THE BEAST OF BUNGAY! 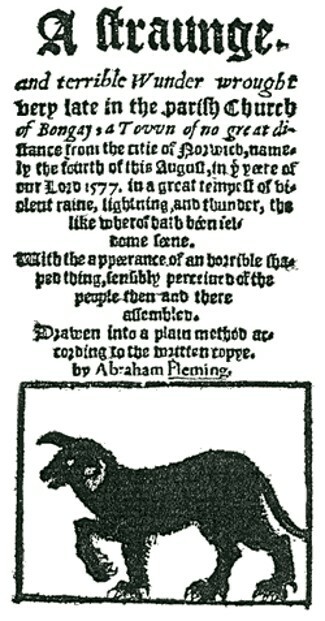 One of the most terrifying Black Dog appearances ever recorded allegedly took place on the morning of 4 August 1577 in the small Suffolk town of Bungay. 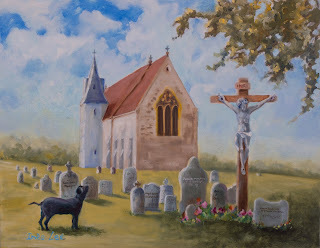 During a fierce electrical storm, a ferocious, malevolent Black Dog materialised inside St Mary's Church, and ran amok through it, attacking the terrified parishioners and leaving havoc and horror in its wake. According to records dating from that time, this "strange and terrible wunder [sic]" tore the throats out of its victims, and scorched one hapless man as if he were a piece of leather burnt in a hot fire. Nor was that all. Other records claim that on that same day, during the electrical storm, what was presumably the same Black Dog appeared 10 miles away inside another Suffolk church, this time the splendorous Holy Trinity Church at Blythburgh, where similar devastation ensued, with at least three people being slain by the beast, and even the church steeple collapsing, causing the deaths of several more parishioners inside. Moreover, when this Hell Hound finally exited the church, it left the marks of its great claws gouged into the church's door, which can still be seen today (a modern-day photo of them is contained in Graham McEwan's book Mystery Animals of Britain and Ireland, 1986). 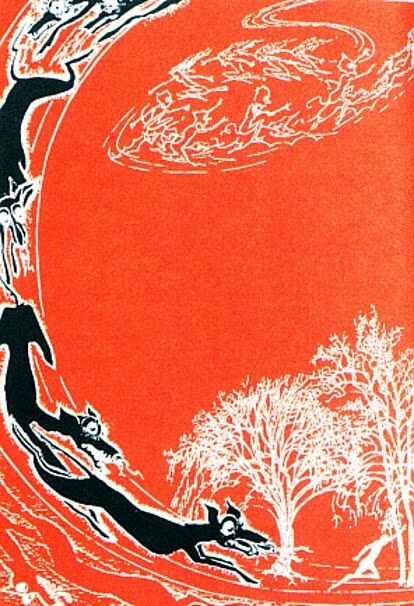 In reality, all of this may have been nothing more dramatic than a massive lightning strike, or even a fireball, transformed by imaginative chroniclers into a supernatural canine visitation. 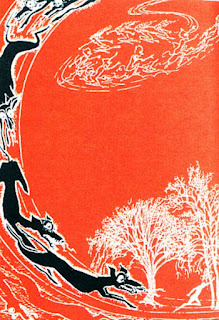 Then again, as revealed here, Black Dog appearances are far from uncommon or unusual events. And something definitely left behind those claw-like marks on the church door at Blythburgh. 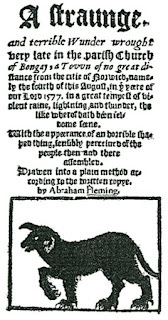 Worth noting is that possibly the earliest Black Dog appearance on record (chronicled in 856 AD by Bertin in the Annales Francorum Regum) featured a red-eyed Black Dog materialising inside a village church during a service, this time in France, where it ran around the altar for a time, seemingly looking for someone, before abruptly vanishing into thin air. 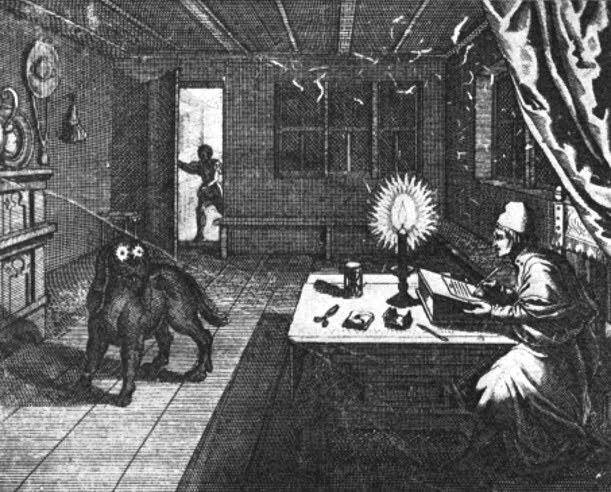 Another early manifestation of a Black Dog allegedly took place one evening in 1552, while Cardinal Crescentius, the papal ambassador to the Council of Trent and infamous for his merciless persecution of supposed wrong-doers, was sitting in his chamber writing a missive to Pope Julius III. Suddenly, a huge flaming-eyed Black Dog with long ears dangling down to the ground materialised before him and moved towards him under the great table at which he was sitting. Both amazed and alarmed, the Cardinal cried out to his servants to enter his chamber and rid him of this foul creature, but to his even greater amazement when they did enter they were unable to see the Black Dog. This shocked him so much that he fell ill, but to his dying day he swore that he could definitely see it, and even claimed that it was climbing onto his bed. In today's ultra-technological world, governed by logic and science at every turn, Black Dogs and other incorporeal canine entities seem sorely out of place, just anachronistic superstitions and shadowy dreams from earlier, magical ages that have no business in the mundane modern-day era. And yet still they persist, legends come to life, doggedly(!) continuing to be reported even today – subtle proof, perhaps, if proof be needed, that the present and the past may well remain intertwined by far more than mere memory. And finally: from the world of fiction but definitely deserving of inclusion in any coverage of hell hounds and other paranormal pooches, I give you Zoltan - Hound of Dracula! At length, the creature lifted its head, letting the limp, rag-doll torso of the soldier slump disjointedly back to the ground. Its ears rose up, satanic and pointed. Its eyes blazed with an unnatural, greenish light. Its enormous jaws, flanked on either side by abnormally huge canine fangs, were drenched in blood that dripped in great gobs to the dusty floor, as a great swathe of a tongue lashed obscenely from side to side with relish. A hound from hell itself had returned...and was now satiated, renewed with warm, youthful blood. REMEMBERING THE BEAST OF BODALOG - A WELSH WATER VAMPIRE? Something has crept, or has been driven out of dark waters under the mountains...Far, far below the deepest delvings of the Dwarves, the world is gnawed by nameless things. Thirty years ago, one of the strangest, eeriest cryptozoological cases ever reported from the British Isles was making headlines nationally and even internationally, and three decades later it has still never been satisfactorily resolved. 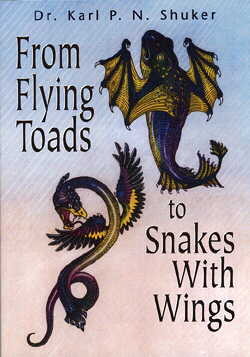 So here is my contribution to its very intriguing history, by way of an article of mine that was subsequently converted into a chapter within my book From Flying Toads To Snakes With Wings (1997) and serves now in updated form as a fitting ShukerNature retrospective to, and reminder of, this macabre yet nowadays all-but-forgotten saga. To describe one of Britain's most bizarre mystery beasts as a water vampire may not be as melodramatic as one would first suppose - especially after considering its unique characteristics. According to media reports, during September to December 1988 its home was seemingly a lengthy river, the River Wye, situated close to the town of Rhayader in mid-Wales, from which it apparently emerged at night to kill sheep on a nearby 2000-acre farm called Bodalog, owned by the Pugh family. Unlike those of foxes and dogs, however, its victims' carcasses were not ripped or torn in any way. Instead, the only sign of their mystifying marauder's attack was a small but deep, penetrating bite just below the neck, close to the sternum or breast-bone (and which duly earned it the memorable monicker of water vampire in some media accounts). No evidence of the creature feeding upon the carcasses was found either, thus making its predatory behaviour even more weird and difficult to understand. Nevertheless, by the middle of October 1988 this mysterious beast had killed at least 35 sheep. Its scent had been trailed back and forth to the river by foxhounds, but it was never seen or identified, and no recognisable pawprints were found either. As noted by London's Daily Mail newspaper on 10 October 1988, many suggestions regarding its possible identity had been offered, ranging from otter and dog, to mink and even to some form of snake. University scientists had examined the carcasses and admitted to being thoroughly perplexed. Their bewilderment is not surprising, as the Bodalog beast clearly poses some singular problems, with none of the more conservative explanations satisfying the facts available. Its aquatic habitat immediately rules out a fox, cat (even an escapee big cat), or stray dog as the culprit - as well as a human hunter using a crossbow, which had also been suggested by some authorities. European otters Lutra lutra are relatively large creatures, but are certainly not sheep killers. They are known to take small mammals in their diet from time to time, but nothing approaching the size of a sheep. In any event, their principal sources of food are fishes and aquatic crustaceans - and, needless to say, they do eat prey killed by them and they do leave tell-tale spoor behind. 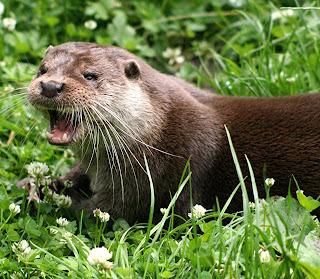 Mink, although much smaller than otters, are far more bloodthirsty by nature. Not native to the British Isles, they now exist in a naturalised state in many parts of the country - descendants of fur-farm escapees belonging to the American species, Neovison vison. 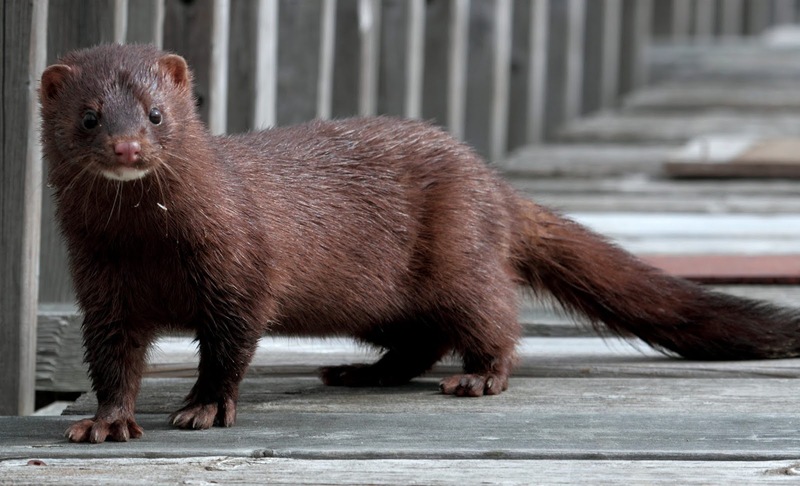 Mink have wide tastes, ranging from fishes to birds as large as moorhens, and mammals as large as young rabbits (reports even exist of mink having killed pet cats and dogs!). Nevertheless, sheep would surely be far too large for any mink to tackle successfully. One suggestion, from an unnamed 'expert', was that some form of giant mink was responsible! Mink, however, do not normally attain a total length greater than about 26 inches in the wild, and there is no evidence whatsoever that mink of a size commensurate for sheep killing have ever existed in Britain. A little-known species called the sea mink N. macrodon once inhabited the coastal waters of New England and the Canadian maritime provinces, and was indeed somewhat larger than other mink species, but it became extinct in the early 1880s, and is totally unknown either in living or in fossil form in the Old World. Britain only has three native species of snake. 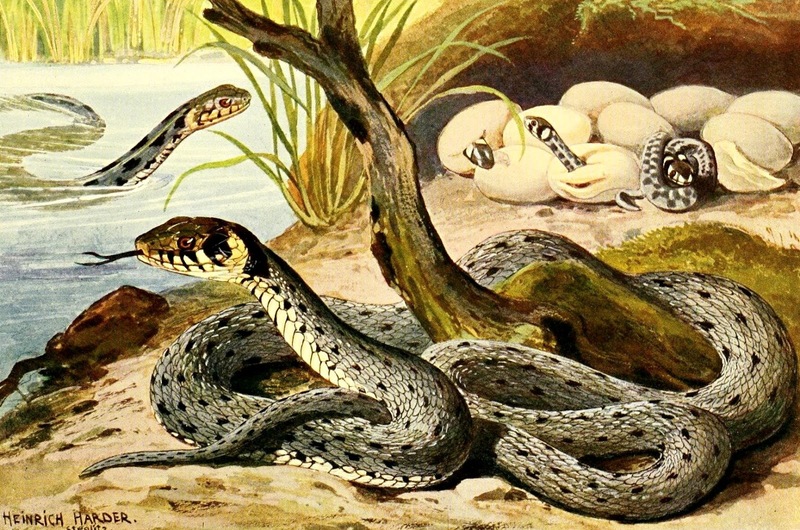 [NB - herpetological researchers revealed in 2017 that there were actually two taxonomically distinct species of grass snake living here, not just one, but only one of them is native, namely Natrix helvetica; unfortunately, various media reports confusingly and erroneously claimed at the time that both of them were native and that there were therefore four native snake species existing here.] The sole venomous species is the European viper or adder Vipera berus, which is predominantly ground-living, diurnal, and feeds on nothing larger than lizards and small mammals. Relatively more aquatic by nature are the non-venomous and diurnal eastern grass snake Natrix natrix (represented in Britain via various small, introduced, non-native populations) and its close relative the western or barred grass snake N. helvetica, the new name for Britain's native grass snake species. The preferred prey species of these two species are amphibians and fishes, though nestling birds and small mammals are also occasionally taken. In addition, Britain has a small number of the smooth snake Coronella austriaca, again native but confined to southern England. This is another non-venomous, diurnal species whose diet consists mainly of lizards and small mammals. Also worthy of note is the aesculapian snake Zamenis longissimus, which is a mainland European species that has established a couple of small but seemingly thriving naturalised population in Great Britain – one in central London, England, and the other in Colwyn Bay, Wales. Both populations originally arose from escapee/released specimens surviving and mating in the wild in these locations. So might the Beast of Bodalog have been an aesculapian snake, derived from the Welsh contingent? At up to 7 ft long, this species is certainly lengthier than any of Britain's native species, but just like all of them it is diurnal, and it is not venomous. Clearly, therefore, none of these five species constitutes a very convincing candidate for the Welsh sheep killer. It has never been formally ascertained whether the Pughs' sheep were actually poisoned by their attacker, but if tests were to reveal that this did occur, then it is possible that a non-native and evidently sizeable, aquatic venomous snake was on the loose at that time. 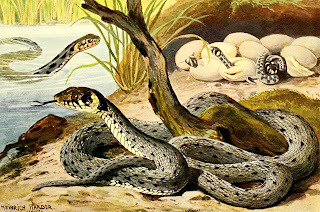 It could have been a pet that either escaped or, for some reason, was released, as in the above-noted London and Welsh instances featuring the aesculapian snake. Yet if this were true, then it could have potentially posed a very real, severe dilemma - for there are few animals on Earth as elusive as snakes, especially those species that are adept at travelling not only across the land but also through the water. Perhaps, then, it is not too surprising that the sinister 'water vampire' of Wales was never seen, let alone tracked down. Its killing spree abruptly ended in early December 1988, and nothing like it has ever been reported since from Bodalog (or anywhere else, for that matter, at least as far as I am aware), so presumably it simply died (see below) - always assuming, of course, that it didn't move elsewhere. Yet if it had indeed been some form of very large, powerful snake, why did it kill so many sheep but never make any attempt to feed upon their carcasses afterwards? Moreover, how could such a creature have survived for at least two months in the distinctly chilly climate present in mid-Wales during late autumn/early winter? After all, snakes are poikilothermic (cold-blooded) and therefore rely upon warm external, environmental temperatures to maintain their own body heat. Like all others associated with this decidedly strange saga, these questions are likely to remain unanswered indefinitely. This ShukerNature blog article is excerpted and expanded from my book From Flying Toads To Snakes With Wings.